"The one who does, is the one who learns." 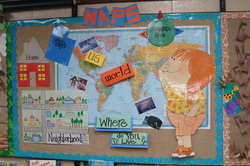 Check out Mrs. Fillmore's use of A.L. Mrs. Fillmore makes accurate academic language accessible in the classroom. After she teaches students terms they are displayed around the room (the terms, not the students).